It’s been a while since we’ve had an episode of PreSonus Live—we’ve been real busy; and have launched a ton of new products in record time. So, we’re having Rick host a new episode of PreSonus LIVE featuring all six of these new products in sixty minutes. He’ll be visited by many familiar Product Managers—plus a couple more that will be making their first appearance on the show. Of course, it wouldn’t be PreSonus LIVE without a giveaway or two, so we’ll be giving away a Quantum 2, a copy of Studio One 3 Professional, and a pair of Eris E44 monitors. To enter the giveaway, all you have to do is post to Facebook or Twitter with the #PreSonusLive hashtag and the link to the show. Posts in chat rooms are not an eligible form of entry. 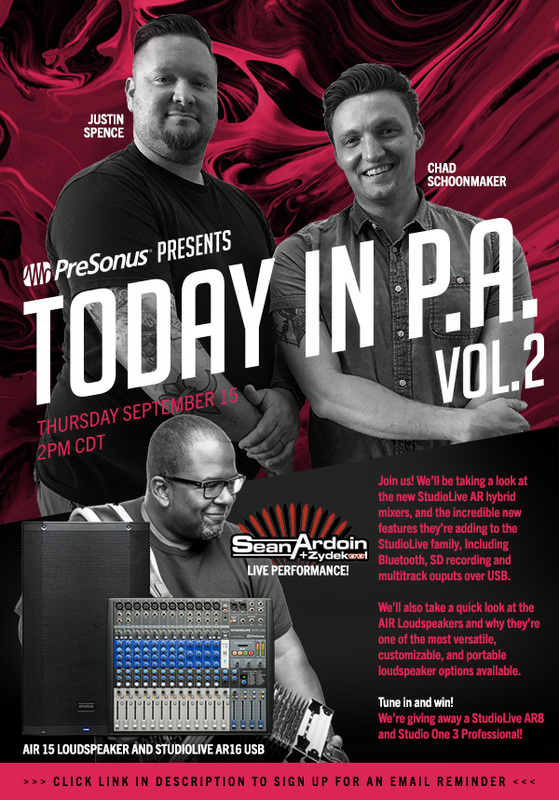 PreSonus LIVE Airs Thursday 9/15—Today in PA Vol. 2! Join us! We’ll be taking a look at the new StudioLive AR hybrid mixers, and the incredible new features they’re adding to the StudioLive family, Including Bluetooth, SD recording and multitrack outputs over USB. We’ll also take a quick look at the AIR Loudspeakers and why they’re one of the most versatile, customizable, and portable loudspeaker options available. Tune in and win! 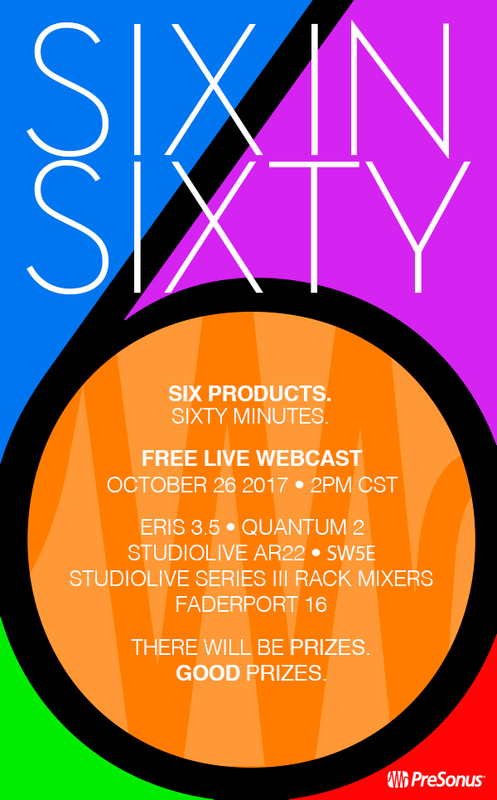 We’re giving away a StudioLive AR8 and Studio One 3 Professional! Enter your e-address below to get a quick e-mail reminder on the day of the show. Watch the show on Thursday 09/15, streaming live at presonus.com/videos/presonuslive or on our YouTube channel! Comments Off on PreSonus LIVE Airs Thursday 9/15—Today in PA Vol. 2! 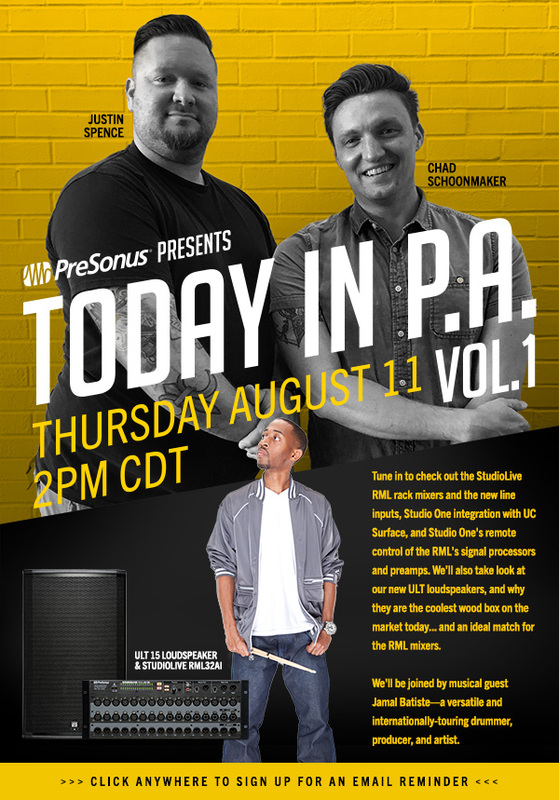 PreSonus Live 8/11/16: Today in P.A., Vol. 1. 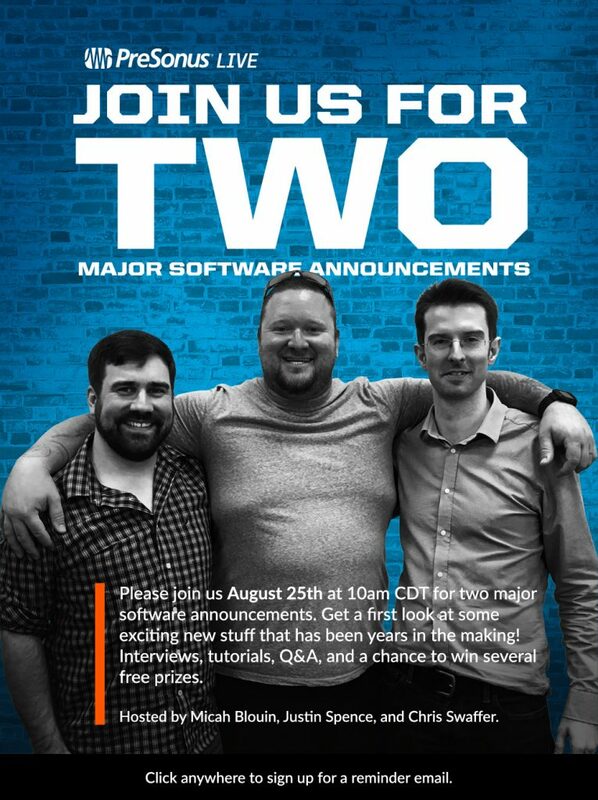 PreSonus LIVE is BACK on August 11 at 2pm CDT! Tune in to check out the StudioLive RML rack mixers and the new line inputs, Studio One integration with UC Surface, and Studio One’s remote control of the RML’s signal processors and preamps. We’ll also take look at our new ULT loudspeakers, and why they are the coolest wood box on the market today… and an ideal match for the RML mixers. We’ll be joined by musical guest Jamal Batiste—a versatile and internationally-touring drummer, producer, and artist. Click here to watch the show on Thursday, or use the form below to receive a reminder e-mail on the day of the show. Comments Off on PreSonus Live 8/11/16: Today in P.A., Vol. 1. 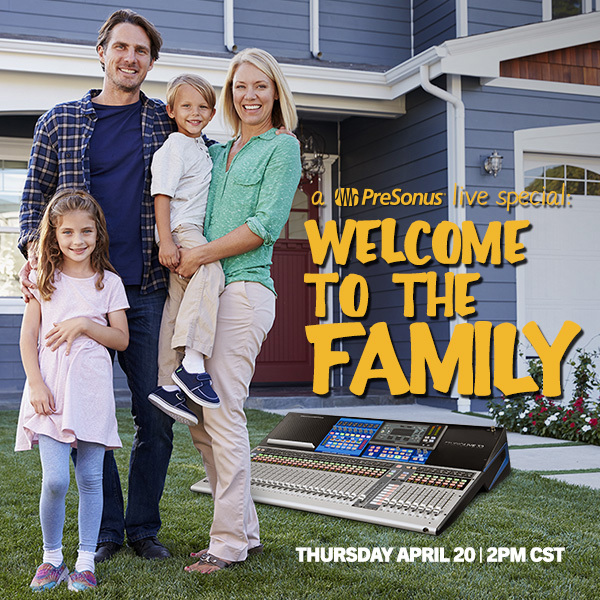 Tune in to PreSonus LIVE on March 31 at 2pm CST to learn all about PreSonus hardware and software integration: remote preamp control of the Studio 192 and StudioLive RM mixers from Studio One, remote Fat Channel control, and using the StudioLive CS18AI to control up to 64 channels in a StudioLive Mix System. This show will also feature a ton of special guest interviews (see right) as well as a live performance from critically lauded Baton Rouge post-sludgecore doomsters THOU. Click here to watch the show on March 31. Need to know the showtime in your time zone? Click here. Need a reminder? Just pop your e-mail address into the form below to receive a reminder e-mail on the day of the show! Hooray, no more Eventbrite! 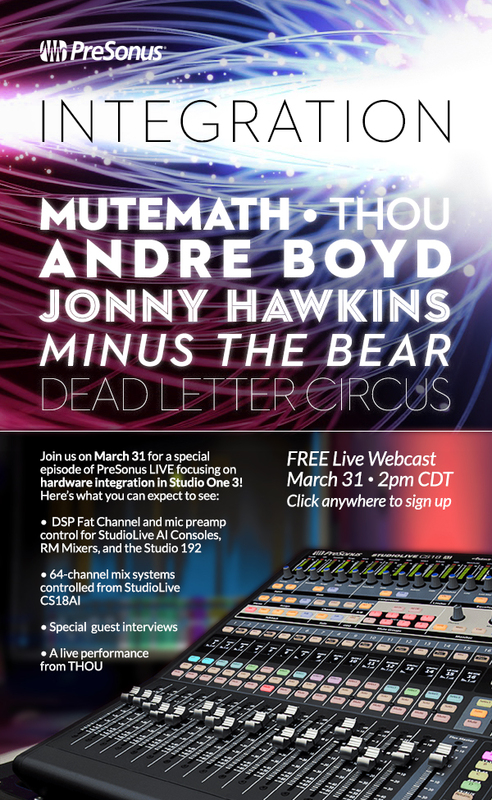 TUNE in on February 25th at 10 AM or for the 2 PM rebroadcast at: http://www.presonus.com/videos/presonuslive. UPDATE 2/16/16: we’ve added more prizes to this show! You’ll receive a prompt to enter the giveaway via e-mail when you view the show on Feb 25. We will also have a separate giveaway for our Twitter audience. It’s time for another FREE mind-blowing update to Studio One 3! Tune in on Feb. 25 at 10:00 a.m. CST for interviews with several accomplished producers, where they will be showing off everything new in the forthcoming update to Studio One 3. We’ll also run a rebroadcast at 2:00 pm CST. What ARE the new updates, you ask? What are the new features? And when are they coming? 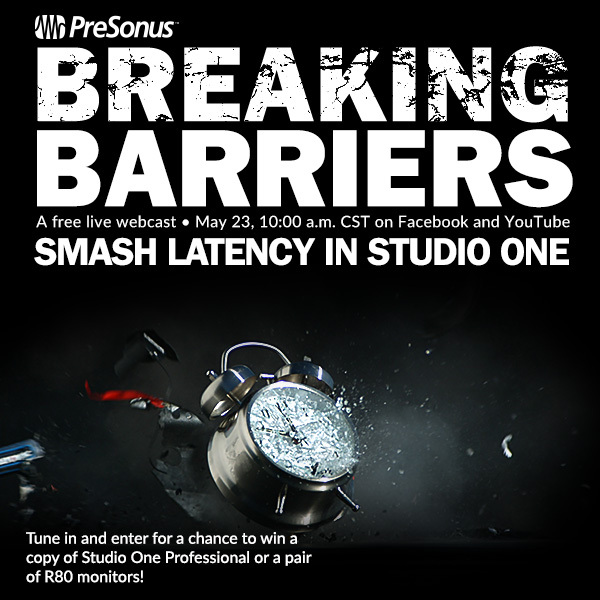 Tune in on Feb. 25 to find out, at: http://www.presonus.com/videos/presonuslive. We’ll be giving away a StudioLive RM16AI to a viewer of the first broadcast. Pre-register via this Eventbrite ticket to receive an e-mail reminder on the day of the show! 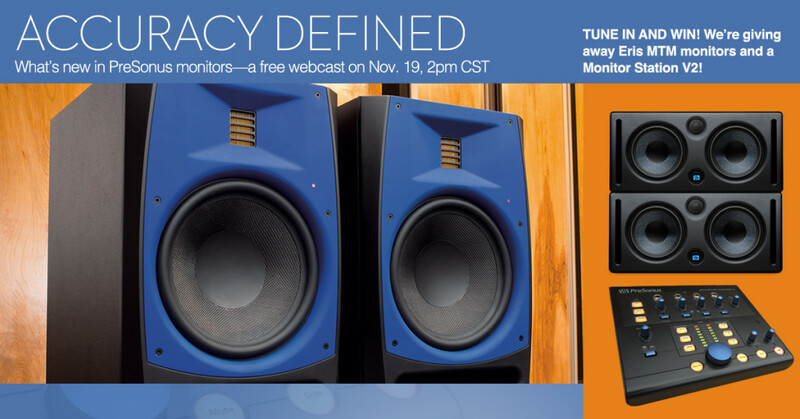 Join Justin Spence as he takes us on a tour of the latest monitoring offers from PreSonus: the R Series monitors and the Eris MTMs! He’ll also talk about monitor setup and monitor controllers like the Central Station and Monitor Station. TUNE IN AND WIN! 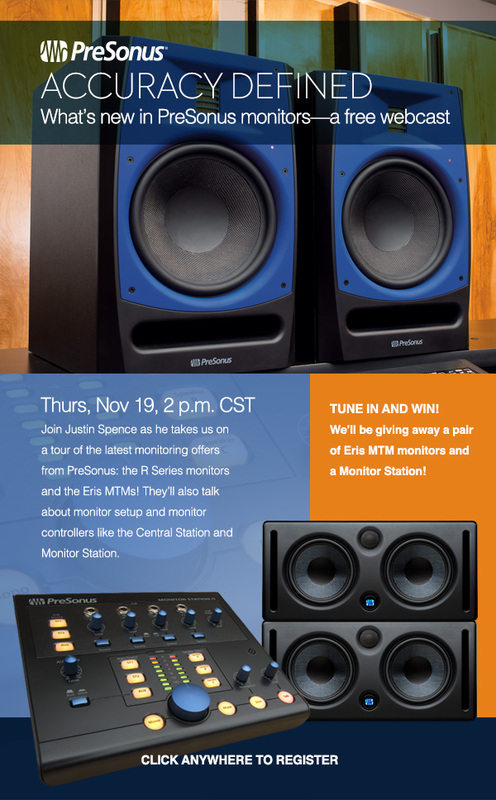 We’ll be giving away a pair of Eris MTM monitors and a Monitor Station!